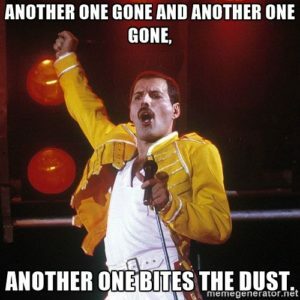 If you’re a Queen fan, you might be singing “Another One Bites the Dust”. Since the advent of Obamacare, United Healthcare, Aetna, Cigna and now Anthem have pulled out of the state of California. Although most people think that health insurance companies are making tons of money (and they are)… it’s mainly because they have so many clients. But their profit margins are small. Did you know that the federal government mandates that all carriers must spend a minimum of 80% of premiums on actual claims? So that only allows the carriers 20% to run their business and make a profit. I’m sure that if many other businesses were told that they could only be allowed 20% of revenue for all business expenses and profit, they’d close their doors immediately – knowing that they could never survive. If the carriers finish any given year then find that they did not spend 80% of premiums on claims, they must refund the difference to their insureds. And if they spend more than 80% on claims, then they make less profit (or show a loss). And that is what has been happening – they’ve been showing a loss. United Healthcare lost $500,000,000 (half a billion dollars) in a single year just before pulling out of the individual health insurance market. Not that many of us care about insurance companies making money. But if they lose money, they stop selling insurance and then there’s nobody left to insure us. Thankfully we still have several carriers left in California – but who knows how long they will last? While Obamacare had some beneficial features, it’s driving the insurers into a death spiral* and hence, out of business. Let the federal government run health insurance? It’ll drive them out of business too – for the very same reasons. And you can only continue to print money with no actual backing for so long. The problem must get fixed – and soon. Fixing it is going to require the cost of healthcare to get under control so costs will come down…. so health insurance premiums can become truly affordable…. so people will buy health insurance and have it when they need it. After all – you can’t wait to buy health insurance until you need it… you have to already have it when you need it. But most people won’t buy it unless it’s truly affordable. So that’s what must happen. Period. Click here to see my related article… The High Cost of Health Insurance…. Solved! *Death Spiral – When more sick people buy health insurance than healthy people… so there are more claims paid out than premiums coming in.